Cobblers boss Chris Wilder is anticipating a difficult afternoon at Sixfields on Saturday against a free-scoring Morecambe side (ko 3pm). Town are the top scorers in Sky Bet League Two, having netted 46 times in 26 games, but hot on their heels are the Shrimps, who have scored 45 in 25 matches. The difference between the teams is at the other end of the pitch, where the Cobblers have conceded 30 to Morecambe’s 43, but Jim Bentley’s side are still very much in the race for a play-off place. They are 13th, but just five points shy of the top seven, and Wilder is a big admirer of the job that Bentley and his team have done at the Globe Arena. 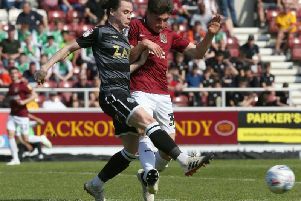 “The job that Jim Bentley does, and Kenny McKenna up there, with the resources they have is great,” said the Cobblers boss. “Sometimes they go unnoticed so the pressure is not on them as much as it is on the bigger clubs, which can sometimes make it a little bit easier for them, but they have to work hard on the training ground. “They have to go out and look for players and pick up players like Shaun Miller and Jamie Devitt and others, dust them down and get them going again, and that is a skill. “They always play good football, are always a threat, and never look like going out of the League which is a great achievement. “Everybody has to set their own goals, and there are clubs in this division that will have to get out of the division this season, they will have to because of the amount of money they have paid. “Then there are clubs that will be looking at it and saying ‘it is an achievement to stay in this league’, so it is all relative. “But being the professional people they are at Morecambe, to keep lifting the boundaries, they want to win every game they play. “As players Jim and Kenny had the desire to do well, and as coaches they certainly have that desire to win every game. The Cobblers were 4-2 winners at Morecambe earlier in the season, and haven’t lost to the north west side in the past eight meetings between the sides. Indeed. Morecambe have won only one of the 13 matches played between the sides, and that was a 2-0 win at Sixfields in August, 2011. Town welcome cup-tied pair James Collins and Lee Martin back into the squad this weekend, while Wilder is also hopeful Alfie Potter will have fully recovered from the rib injury that has kept him out of action since December 28. Definitely ruled out are Lawson D’Ath (groin) and Paul Corry (knee).